A piece of the rope that was used to execute former Iraqi ruler Saddam Hussein has been put up for auction with the latest bid standing at $7 million. The current owner of the morbid object is Iraqi politician Dr. Mawaffak al-Rubaie, who led the dictator to his death. Numerous people, including a rich Israeli family, a religious organization in Iran and two Kuwaiti businessmen have expressed a serious interest in buying it, Middle East news website, Al-Araby al-Jadeed, reported. However, another current affairs website, Middle East Eye, says that Dr. Al-Rubaie wants more cash than the $7 million offered so-far. Saddam Hussein, the former President of Iraq, was in power for more than 23 years until being deposed from power by an American-led invasion in 2003. Hundreds of thousands of people, including many Kurds and Shias, are believed to have been killed during his brutal rule on account of their political and religious views. Caleb Maupin, a political analyst, told RT: "This just shows how cheap justice has become when they are selling the implements of execution - profits really dominate everything, nothing is really sacred. If you look at all the countries the US has invaded whether it's Iraq, Afghanistan, Libya, Yugoslavia, which suffered from US bombing, never did they bring stability, never did they bring peace. They bring chaos and destruction. War is really motivated by profits and this is just a further illustration of that." Dr. Al-Rubaie was himself tortured by forces working for Saddam because of his political beliefs. He believes that Saddam deserved to be executed and he told the Independent in 2013 that he had nothing but contempt for the old man as he led him to the gallows. “I was hoping to see him show some remorse for the terrible crimes, the hundreds of thousands of his own citizens that he and his henchmen killed. But there was nothing,” he said. However, the grisly auction has sparked criticism from human rights groups, while one campaigner, Ahmeed Saheed, told Al-Araby-Al-Jadeed that he thinks the proceeds from any sale should be given to the Iraqi treasury. 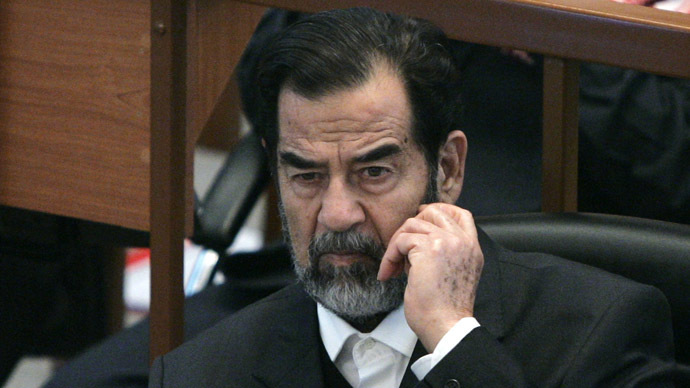 Saddam was found guilty of crimes against humanity by the Iraqi Special Tribunal in 2004, although many rights groups including Amnesty International believed the trial to have been unfair. As many as 206,000 people have died since the US invasion in 2003, and the country is now battling a bloody insurgency, with Islamic State militants in control of many areas of the north and west of Iraq, amid other sporadic acts of violence, bombing and killings between the Sunni and Shia populations.